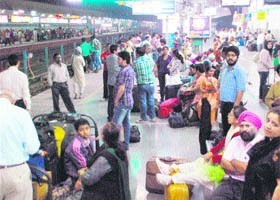 Hundreds of passengers from the Chandigarh region, who were scheduled to board Delhi-bound trains, including long-haul trains touching the National Capital, had to face a lot of inconvenience due to the derailment of the Kalka-Howrah Mail (12312) near the Sonepat railway station in the wee hours of today. After nearly a month, the standoff between Bharat Sanchar Nigam Limited (BSNL) and the private service providers came to an end, as the former restored all points of interconnection between the BSNL landline and mobile phones of private service operators here today. This year, the satellite towns of Panchkula and Mohali, said to be the poor cousins of Chandigarh, seem to have celebrated Diwali as never before. Irregularities in the local Registration and Licensing Authority (RLA) office can run into crores, the inquiry report by Additional Deputy Commissioner ML Sharma has said. Trouble for Healthyway Immigration Consultancy does not seem to end. After being shut for duping clients in the region on fake promises of easy immigration overseas, the estate office sealed the basement of the company’s Sector-42 office today for misuse as a pantry was being run there. It is raking moolah for the Greater Mohali Area Development Authority (GMADA) as the Mullanpur Eco City is believed to have netted around Rs 4,500 crore as earnest money from around 1.25 lakh applications received at various banks authorised to collect application forms. 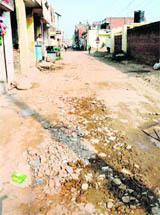 Seventy-year-old Mohinder Kaur, who is residing at Dadu Majra village here, has been denied her routine walk in the park nearby as the road adjoining her house has been dug up by the municipal corporation (MC) authorities three years back, but has not been carpeted so far. Over 80,000 residents of group housing societies are annoyed at the UT Administration’s apathy towards their societies as against the Chandigarh Housing Board (CHB) allottees. Residents of all housing societies, including CHB, have paid identical development charges to the Administration, yet there are different set of rules and the facilities are not the same. While basic and estate services are being provided to CHB allottees, the same are being denied to various societies. 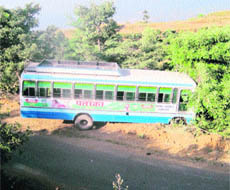 Nearly 90 passengers of a Haryana Roadways bus bound for Morni had a narrow escape when the bus driver lost control while trying to save a couple travelling by a scooter. The bus skidded and its front portion was left hanging over a 50-ft gorge. As a part of the Food and Drugs Authority’s (FDA) ongoing campaign against nicotine, a team led by Panchkula drug control official Pooja Chaudhary today raided “Paint Ball”, a hookah bar, located in Gunthala village near North Park on the outskirts of Panchkula. 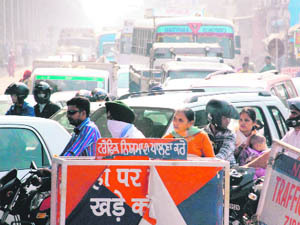 Considering numerous past cases where accused were acquitted due to failure of prosecution and police to bring substantial evidences before the court to strengthen the case, the Panchkula Deputy Commissioner of Police (DCP) has issued instructions to all police officials, who are investigating officers, to have a better coordination with law officers to ensure conviction to criminals. Rajiv Sood, a local resident, has lodged a complaint against the State Bank of India for misplacing valuables kept in the bank’s locker. Complainant Rajiv Sood said he and his mother had a joint account in the Sector 37 branch of the bank. The District Consumer Disputes Redressal Forum has slapped a fine of Rs 10,000 on the State Bank of India for mental agony and harassment suffered by former DGP Punjab Dr AA Siddiqui. The District Consumer Disputes Redressal Forum-I Chandigarh slapped a fine of Rs 10,000 on Pi Scholastics for its failure to refund deposited fee of Rs 33,090 to a Sector-51 resident. The District Consumer Disputes Redressal Forum directed Oriental Insurance Company to refund Rs 6 lakh to a resident of Mohali for the theft of his vehicle. The weather would remain dry in the coming weeks, as there is no major change in the day temperature, which was hovering around 30 degrees Celsius. Six cases of dengue have been reported at Government Medical College and Hospital (GMCH), Sector 32, here. With this, the total number of cases has reached 48. 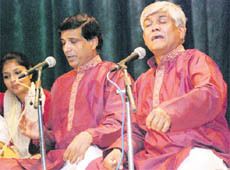 The seventh Brahaspati Sangeet Smaroh got off to a grandiose start with an immaculate vocal recital by the leading Dhrupad maestros duo of Pandit Umakant Gundecha and Pandit Ramakant Gundecha with Akhilesh Gundecha on pakhawaj at the Law Bhawan auditorium here today. To solve the problem of staff shortage, the Mohali police carried out a recruitment drive today. The police officials said against the 200 posts of constables, 9,300 applications had been received so far. Applicants are being called in batches of 1,500 for the physical test being conducted at the Phase VI government college. Most of the applicants are in the 18-25 age group. On a call given by the All-India State Bank Officers’ Federation, bankers held a protest here on Friday in preparation for the all-India strike on November 8 and 9. Addressing agitating officials, MK Virmani, general secretary of the State Bank of India Officers’ Association, Chandigarh circle, condemned the management on its casual approach towards the long-pending issues. Bringing laurels to the college, students of Postgraduate Government College for Girls, Sector 42, bagged 20 prizes in the Zone B Youth and Heritage Festival held at the National College for Women, Machhiwara. 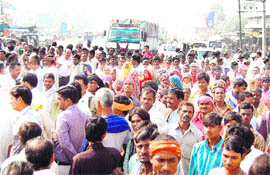 Around 200 grain dealers of the New Grain Market, Ambala City, blocked the Ambala-Hisar national highway for an hour to protest against police inaction. A special exhibition train throwing light on the life and achievements of Swami Vivekanand reached the Ambala Cantt railway station today. 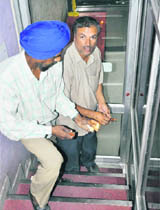 The train was flagged off from Howrah on January 12, 2011, to commemorate the 150th birth anniversary of Swami Vivekanand. The police today booked five persons in an assault case on the complaint of Anil Kaushik, a Kharar-based advocate. The accused have been identified as Vijay Kumar, Lovepreet, Lovely, Deepak and Aman, all residents of Kharar. 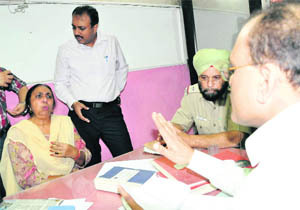 The special investigating team (SIT) of the Chandigarh Police, formed to crack down on illegal immigration firms operating in the city, arrested the owner of a Sector-34 immigration firm, Institute of Personality and Aptitude Test, for duping a resident of Kapurthala district of Rs 4.30 lakh on the pretext of sending her abroad. The police also sealed the company’s office. A 27-year-old married woman was allegedly drugged and raped here yesterday on the pretext of providing her a chance to work in Bollywood. The victim, in her complaint lodged with the police, stated that she had worked in a few television serials earlier, but was out of work at present. Kishore Pal (35) of Colony Number 4 in Industrial Area, Phase-I, was stabbed to death when he tried to intervene in a bloody brawl on Thursday night. The incident took place near the victim’s residence when four persons attacked one Jetinder Kumar with some weapons. An 18-year-old labourer died after being hit by a speeding car near Shagun hotel on the Zirakpur-Panchkula highway on Thursday. The deceased was identified as Mahesh Kumar, a resident of Peermuchalla. The work of much-awaited shooting range at Panjab University has come to a halt when it was found that substandard quality of material has been used for its construction. Punjab cricket team defeated Himachal Pradesh Cricket Association (HPCA) to retain the all-win record during the last north zone league match of the ongoing Vinoo Mankad Trophy being held at Delhi. 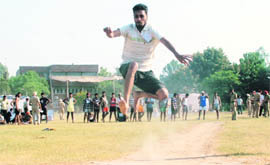 Shuttlers of local GGD SD College defeated JC DAV College, Dasuya, by 3-0 during the match of the Panjab University Inter-College Badminton Tournament for Men (team event) played at Panjab University gymnasium hall here today.